The 2017 edition of the Middle East Packaging Summit kicked of on 18 September at the Sheraton Dubai Creek Hotel & Towers in Dubai. 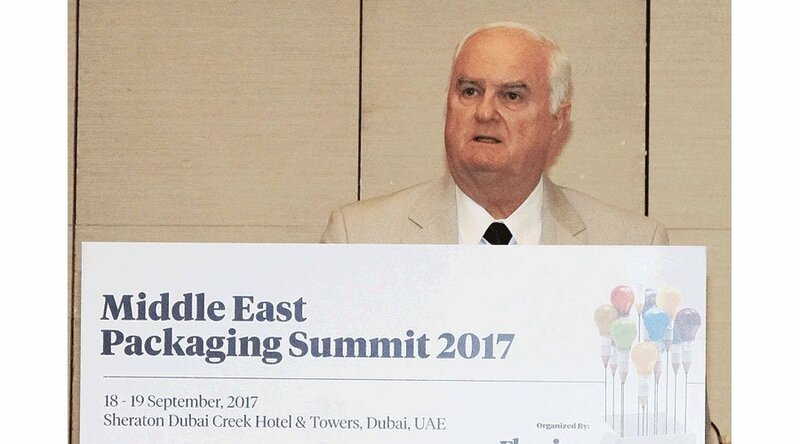 The leading packaging conference in the Middle East, it began with a keynote address by the president of the World Packaging Organization, Thomas Schneider who spoke of trends and developments in the global and Middle East packaging markets. He emphasized the great opportunities engendered by the demographics in Asia, the Middle East and Africa (for an industry that depends on per capita income surpassing subsistence levels) with increased disposal incomes in the hands of an increasingly enlarged middle class. Schneider also highlighted the impact of consumer behavior on packaging and how sustainability must fit into the packaging equation. In ‘The creating value with packaging’ session,’Kurt Kuruc, managing director of Klöckner Pentaplast FCP in Turkey looking after Food and Consumer Packaging in the MEAI region looked at the plastic packaging supply chain and examined the benefits and costs of over and under-engineering a variety of solutions. A panel discussion on ‘Alternative packaging materials — what is expected by packaging users?’ deliberated on the possibility of more sustainable materials to achieve regulatory compliances that are becoming more stringent in the region as well as the need to reduce the overall carbon footprint of packaging. Saikat Acharya, GlaxoSmithKline India’s regional manager Technical Packaging Consumer Healthcare Supply Chain in ISC, Middle East and Africa, spoke about food packaging in a dynamic supply chain environment. ‘The impact of ME legislation on packaging functionality and costs’ was presented by Dr Priti Baijal, Sanofi UAE’s head of Regulatory –CHC in the Middle East, Turkey and India and acting head for Eurasia and Africa, who gave a thorough and knowledgeable overview of packaging requirements and compliances for medicinal, food supplement and cosmetics. From Dr Baijal’s presentation it was clear that the UAE regulations are by and large strict for both products and packaging, neither of which can be changed without permission and compliance. On the afternoon of the first day Idealliance G7 Expert and color consultant Ron Ellis spoke about the ISO color standards and three levels of G7 Master certification for quality printers. In his presentation about Methods for Managing Brand Quality and Supply Chain Efficiency, Ellis presented a case study of what it costs a brand when supplies are rejected for quality and color matching reasons and daily commitments to fill the shelves of supermarkets cannot be met. He said that the brand which at first “had no budget” for streamlining and calibration, lost US$ .5 million in just ten days of being unable to meet its supply commitments and his guess is that similar brands lose perhaps US$ 5 million each year because of color quality failures. Ellis also mentioned new standards such as ISO 15339 which will allow brand owners to select acceptable and matching appearances of print on a variety of substrates regardless of printing process. He urged brand owners to select suppliers who have been evaluated and certified so that the communication of specifications including color tolerances are a meaningful help to those printers who can use them to consistently produce excellent work and thereby increase supply chain efficiency. He said that for packaging brand and spot colors must be specified with LAB values instead of swatches and Pantone numbers. The Idealliance BrandQ live training program is also taking shape. Along with the 3-day training, attendees will also receive access to the Brand Q online training program and resources, as well the Brand Q forum and discussion group. The program is aimed at enabling brand owners to effectively communicate with their print suppliers. Head of Idealliance India Naresh Khanna who is a G7 Expert took part in the Summit, says that an increasing number of brands in the region are demanding G7 certification as a first step in controlling their packaging, as did Faisal Wali, the head of the recently launched Idealliance Pakistan.